Videos are the new frontier for E-learning. This is a major trend that should be considered within an e-learning context, as people are generally more engaged when watching a video than when following a slideshow. And, perhaps surprisingly, video is often used for compliance training. Through video, you can also show how to complete specific tasks and procedures. Not to mention, video is, simply put, less work and more effective. Log into the platform and access the course for which you would like to upload a video. Remember that in order to add content to a course, you must be logged in as an Instructor or have accessed the platform as an administrator. From the Admin menu, select the Courses item in the E-Learning section. Once you are on the main Courses page, find the course in the courses list and select the menu icon at the end of the course’s row, then select Training Materials from the dropdown menu. On the Training Materials page, press the Add Training Materials button, then select Video from the dropdown menu. 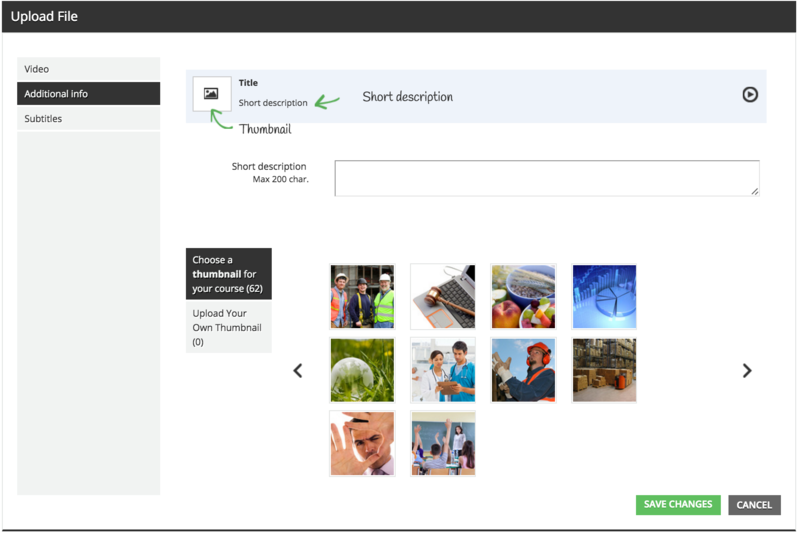 On the upload page, flag the option to upload a file, then select the Upload File button to choose your file. Assign a title and description (please do not use any symbols or characters like “.”, “_”, “-” or spaces in the title), then decide if you want users to be able to move through the video by dragging the playhead. Please Note: If you enable this option,users can jump and skip part of the videos, which will mark the material as complete despite the fact that parts of the video were not viewed. Once your video is finished uploading, you can move to the Additional Info tab. Here, you can add a short description for your video as select a thumbnail for it. You can choose from pre-loaded thumbnails, or upload your own. Finally, add subtitles to your video if necessary. Switch to the Subtitles tab and upload your VTT file that includes the subtitles you want to add. Subtitles must be in VTT format; if you are unfamiliar with this standard please read more about it here. Upload one file for each language you want to include. Then, mark one language as the fallback language. When you’ve completed each tab, press Save Changes. 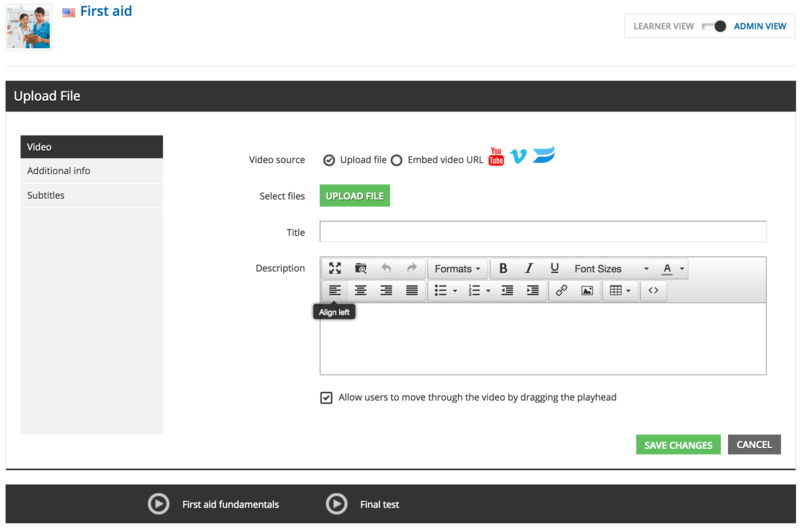 The video is now being uploaded and converted properly into your LMS. It will automatically be optimized by the system. 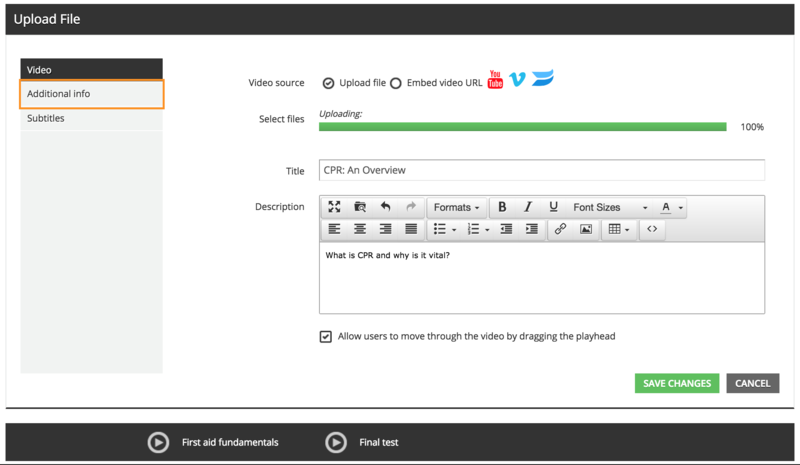 Once the upload is complete, the video will be available in the training resources area. If you want to check the final outcome switch to the learner view using the toggle at the top of the page. In the learner view, click on the title in the video player and play the video. For those using Docebo version 6.7 or higher, we deliver videos using the HLS streaming and encoding technology, which allows Docebo to deliver videos in a more efficient and secure way. HLS technology supports adaptive resolution while delivering the video (the resolution of the served video will change based on the available bandwidth). This format has been chosen because it is the most supported across different computers and devices. Videos are delivered to the final users via Amazon CDN (Content Delivery Network), which means that the content is served via the closest available datacenter to that user. This allows faster loading time and the ability to increase the number of concurrent supported users.